1. The TTC Knitalong (Calling Toronto-area knitters!) is happening yet again, with many excited knitters already planning to descend on the city, knit their way through the streets, streetcars, and subways, and converge with lots of happy purchases and chatter. If you’d like to sign up, do so quickly, since spots do sometimes fill up quickly on some of the teams! Have a 2nd or 3rd choice ready! I’m planning on volunteering along with one of the North teams if all goes well, since that’s a route I haven’t sat in on before. But they all promise yarn and good times. 2. In March I promised you that I would donate proceeds from my pattern sales to charity, in light of ongoing relief efforts in Japan and around the world. And although I mentioned the results of this on my Twitter feed, somehow it got away from my blog and I would be remiss not to finally report to you that, thanks to your purchases and a bit of my own top-up, I donated $400 to charity, split evenly between the Red Cross and Doctors Without Borders. Thank you for your generosity, dear knitters! 3. In knitting progress news, I am pleased to report that my Silk Garden Hourglass sweater now has both two sleeves AND a body, and is moving along swiftly on the yoke. I’d hoped that I might have it done this month, but that does seem a bit less likely now given that, at the time of reporting, the month only has about six and a half hours left in it. Still, I am enjoying it. I ran into a bit of a fretful moment on the weekend when I realized I was down to my 2nd last ball of the darker colourway, but still had 3 more of the brighter one. 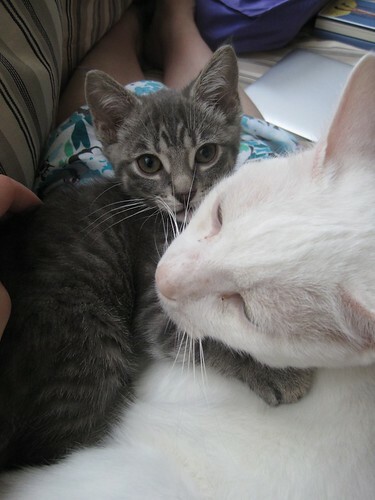 Happily, I also happened to be hanging out with Lisa’s kitties on the weekend (cute kitty picture included below, for reference – new wee Athena, and Greedo), and her place is close to Passionknit, and they had a veritable wall of Silk Garden choices. Now that I have procured 2 extra skeins, I am sure this means I will now manage to squeak by to the very last yard of the original set of yarn, and not need them at all, but one does always want to be prepared to meet that eventuality with some reinforcements at the ready. Thankfully, Silk Garden is always useful to hang around the yarn stash. 4. I’ve been doing a bit of pattern updating, and am happy to announce that my Lamplight Shawl is now available in wide release, both in my Ravelry store and on Patternfish. 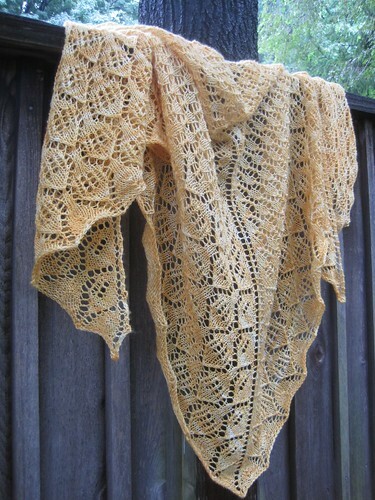 I did this pattern last year for The Sweet Sheep, and the larger version (very cozy, or so I think) uses one of her Soft Spun Super Skeins, which are wonderful in that you can get an entire big shawl out of one and never have to stop to join skeins or weave in ends. 5. Sock Summit Registration happened – and I am pleased to have snagged a few classes once again! I’ll be knitting with Cat Bordhi, Cookie A, and Franklin Habit. It will be a great bit of vacation and visiting and knitting and learning (um, and maybe shopping) and general merriment. Will any of you be there as well? 1. That kitten is too much adorable! 3. I really felt the “where’d May go” when I was working on my monthly report for this month at work. Was I really that unproductive? Oops. I got lucky this time and got some Sock Summit classes. LOVE your shawl! So sad I can’t make it to Sock Summit this year; last time was so fab. Have a great time and keep us updated! I have two wonderful classes each day for 4 days. SO excited! Everyone I know (myself included) seems to have had this issue with June’s arrival. I swear, someone stole a week of May and didn’t tell anyone. I too have a serious case of knitting-the-wrong-sweater-for-the-weather…currently working on Golden Wheat in super fluffy, super warm aran weight merino. Oops. I’m loving the random stripey-goodness of that sweater! I will be at Sock Summit, too…so excited! I love your colour choices for that sweater. So cheerful and rich! Um … knitting silk and wool is wrong in the summer? Don’t tell that to my laceweight cardi, ok? I’ve also got SS11 classes with Cat and Franklin. I’d love it if we crossed paths! I can’t believe we’re in June, either- where did April and May go? Your striped sweater is looking so darn awesome!! And congrats on the sock summiting! The sweater is beautiful. I need to make the jump and get a sweater going. 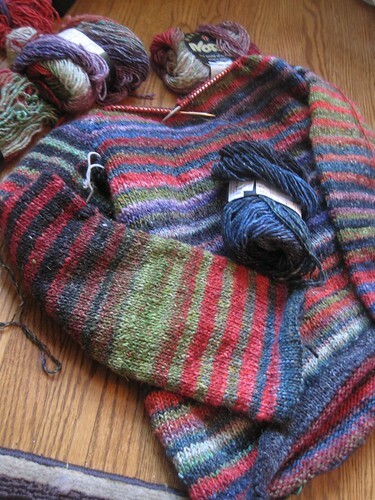 I am such an avid sock knitter, need to put those 4 No.1 needles down. Your sweater is so appealing, perfect nudge for me.